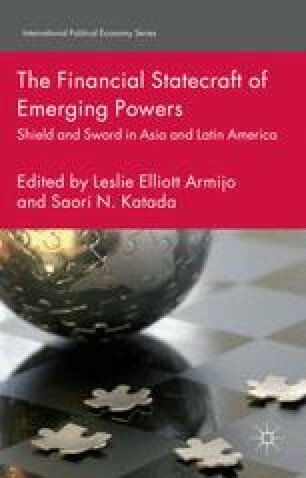 East Asia’s regional financial cooperation emerged from the Asian Financial Crisis (AFC) in the late 1990s, as East Asian governments realized their vulnerability in the face of global financial forces. For them, crisis resolution led by the International Monetary Fund (IMF) had been insufficient and politically problematic. More than ten years later, East Asia has obtained tangible results from cooperation among the ten members of the Association of Southeast Asian Nations, plus China, South Korea, and Japan (ASEAN+3). The Chiang Mai Initiative (CMI) emergency funding mechanism, in particular, has developed into a concrete regional institutional arrangement with legally binding agreements that are considered rare in East Asia (ADB 2010; Kahler 2000). Skeptics of East Asian regionalism claim that the CMI is insignificant and untested: because it has never been activated since its formal inception in 2002, its effectiveness cannot be evaluated (Eichengreen 2009). Nonetheless, member governments, particularly the major regional powers of Japan and China, have invested significant policy effort and committed billions of dollars to fostering this regional financial cooperation. Why? The question is even more curious when one considers that these major creditor governments have on their own built massive walls of foreign exchange reserves to fend off any financial attack against the respective national economies. Dai, X. 2002. China’s Financial Opening-Up and Financial Cooperation in Asia. The People’s Bank of China-Speeches, April 15. http://www.pbc.gov.cn/english//detail.asp?col=6500&ID=6 (accessed on June 5, 2006). Rabinovich, S. 2009. “China Officials Call for Displacing Dollar, in Time,” Reuters, 6 July, 2009; http://www.reuters.com/article/idUSTRE5650WO20090706. Wen, J. 2009, FOCAC: Transcript of Press Conference by Premier Wen Jiabao. Pambazuka News, November 12, Issue 457 http://pambazuka.org/en/category/africa_china/60182 (accessed January 19, 2010). Xinhua News. 2012. Hu Urges Fair, Orderly World Financial System. June 20. http://www.china.org.cn/world/G20_2012/2012-06/20/content_25693822.htm (accessed on July 16, 2012). Zhou X. 2009. Reform the International Monetary System. People’s Bank of China. March 23. http://www.pbc.gov.cn/english//detail.asp?col?6500&ID?178 (accessed July 16, 2012).